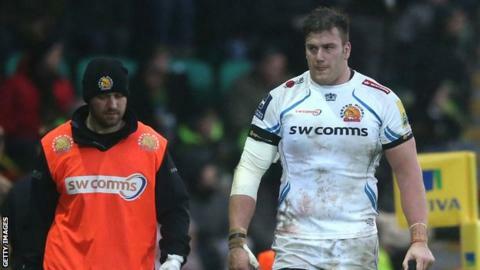 Exeter are set to sign a lock from a Pro12 club and an overseas back. The Premiership side have been hit by injuries to key players in both positions in recent months. Chiefs are also close to signing a second lock who will join the club in the summer and extending the contracts of a number of the existing squad. "We've been pretty active over the last two or three weeks, we're pretty satisfied to where we're going to be this year," head coach Rob Baxter said. Mitch Lees and Damien Welch have both been ruled out for much of the remainder of the season, leaving England second-row Geoff Parling as the only experienced lock available to the Chiefs. While Baxter would not reveal who he was in talks with, he said he hoped to announce the signing in the next few days. "He's a player invoked in the Pro12 at the moment. We think it's a really good fit for us and people will understand that when they see the player it is," said Baxter. "Initially with the first injury to Damien we were thinking we could get through things and we had enough cover, but the second injury to Mitch really tipped the balance too far for us to try and battle our way through. "We've still got another Champions Cup game this weekend and then we've got 10 Premiership games on the bounce." Exeter currently have England centre Henry Slade out for much of the rest of the season, while Sam Hill, Michele Campagnaro and Jack Nowell have all been called up for Six Nations duty, meaning Baxter is also short on backs. "We've still got to wrap up quite a few details on visas etc," said Baxter regarding the overseas signing. "Hopefully by mid-February we'll have someone over here and that will then complete the look of our backs. "Bringing in some extra cover allows us to increase our flexibility. Having guys who can cover one or two or three positions will be very important for us in this next 10-week block."